We at DOORS UNLIMITED have been recently developing & testing some iffy convocational technologies. What kinds of intranests become possible among users who have internalized their internets, we wonder. Imagine an internet. Now, beside that, down the hall, imagine a researcher prototyping a device for transmitting high-speed data thru auxiliary pieces of meat (pork loins, beef livers), while in the next room a child is ashamed for having swallowed a button, while on the beach, out the window, a family is taking turns holding up towels while the others take on or off their bathing suits. Imagine all this happening on the internet while at the same time, you’re waiting in a waiting room or changing in a changing room. How, abductively, you are strategizing a procedure for blending both- as-all-as-it. You are alternating revealing centrifugally & concealing centripetally. All this time, you have been “as”-ing this place as that, enacting yet another neither-time in so doing. Nobody needs to imagine an internet as the staging for this, but when we do, we alleviate its significance some, soften its volume to a mention less overpoweringly articulate than is so often the case. Likewise, it would be foolish, if wishful, to call the the various conduits, programs & interfaces that we’ve been developing “useless.” So far as we have figured, from preliminary demos, the Inner Browser is pretty good for deforming & reorienting ideas about where or why or how we use the internet. But this, for us, is only its most basic application. Just as the internet has invigorated a shared sense of/for screens & scrims & perpetually displaced networlds, we are excited by the glimmers & glissandos, parades & paragrammars, blurs & breathing books prompted by/thru an urge to inner browse. We are designing instruments for destabilizing immediacies, for precariously occupying what zones emerge between play & not-play. These technologies are expressly inefficient & inexact. They do not locate, determine, capture or convey matter that purports to be exterior to the conscious curiosity of the user. Rather, these provisional- conditional devices readily riddle their own pre-settings (as well as whatever settings they operate within). Each Inner Browser is co-authored by its operator to persistently adapt the investigative proclivities of its user, mimicking the characteristic interchanges a user is accustomed to performing in a variety of evocative shapes & textures that themselves bespeak adaption. Once a familiarity with the device is established, a useris likely to encounter everyday interstices as seeming to act up, act out or carry on excessively, unexplainably. Indeed, the technology provokes engagement among contingencies that are not ordinarily communicative. Inner Browsers are even known to intend such intense hyper-causality that their effects are mistaken for melodrama. These same properties of hyper-correlativity & over-emphasis struck us at DOORS UNLIMITED as particularly promising. 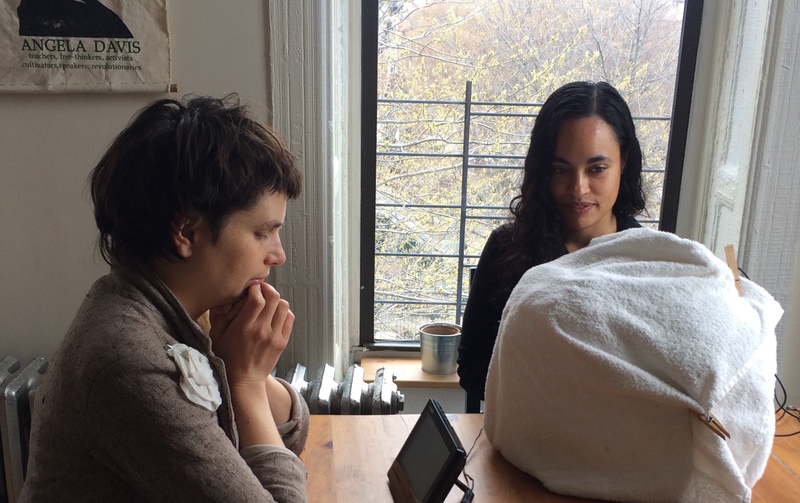 Our practitioners are eager to test Inner Browser technologies in the emergent fields of soap-operatic symposia & ante-institutional resilient resourcefulness. Beginning June 6th, we’ll be hosting a temporary workshop-lab just down the hall from SenseLab at Concordia University in Montréal, QC. Our goal is to work with area researchers & practitioners to further develop & test a variety of low-fi technologies for inner browsing. We propose to share our findings & pose questions regarding the technology’s implications & ramifications with the readership of the Journal of Media Practice as part of its special online issue/forum. How might the residues of exhaustive internet navigation be reinvigorated as vital pluripotencies? 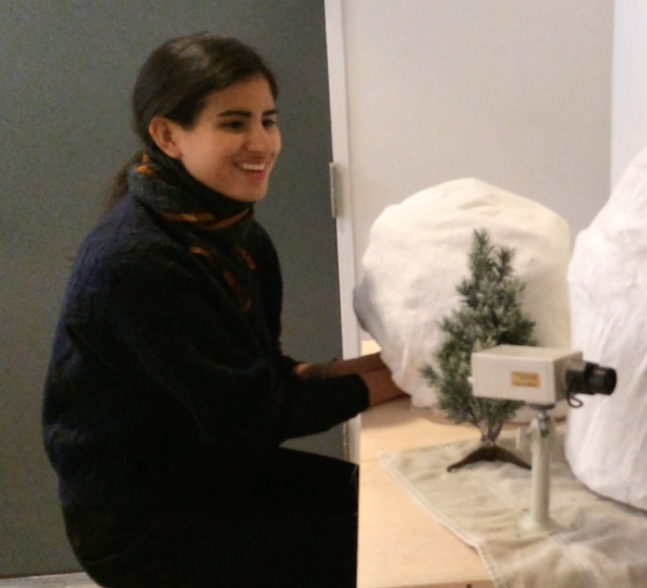 Which methods & maneuvers inherent to existing digital processes already resemble play? What would have to be the case in order for matters of compatibility with existing technologies to be rendered null? How does “deep riddling” compare to “deep googling” & other expressions of habitual internet usage? What kinds of games, jokes & vernacular will the Inner Browser spawn? How will this affect other, related modes of discourse? 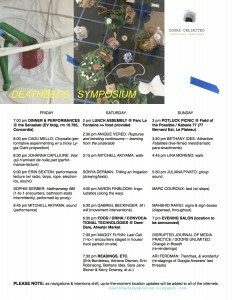 Our intention is to stoke the dJMP conversations throughout the symposium (http://deathbedssymposium.blogspot.ca. 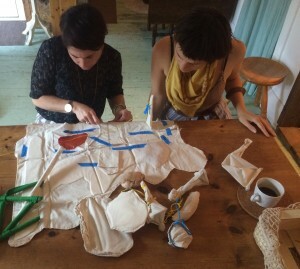 ), to have materials at the ready during shared meals & on walks, all during the elastic “down” time(s). The way we would like best & perhaps be best suited to engage the issue would be less as content contributors & more as transducers. We propose to enter the conversation mid-way through, adopt threads of discourse in progress, & reconfigure those as actual live-flesh/habeas corpus/analogue/non-data, immanently changeable & resilient to the methods of infinite dispersal/cut&parcel&paste tactics of the digital domain. Rather, these ideas will find form & reflexive subjectivity in real bodies, vested in their particular spacial-temporal relationality. Specifically, we are proposing to mount a dialogue that emerges from those represented on the JMP/CDM special issue site. Participant artists & scholars–– we are envisioning more than 2, but fewer than 6–– will each take a thread (a position, exploration, proposition, etc) from one of the issue’s contributors, further research & write themselves into that thread, then synthesize this role in a dialectical picnic staged as part of a symposium set for the weekend of July 15 – 17, here in Montréal. Notably, we will not be producing any content for the internet. There will be no redux, no snapshots, no FOMO prophylaxis. We are not proposing that any convocational eventedness would or could or should gain efficacy by means of its becoming distinctly less situated. Our approach is one that is very likely to induce connectivity around the sharing & refining of ideas pertaining to the issue’s focus, however we would not like for the “result” to be represented as part of the issue’s document. Perhaps it is more that the issue is represented as part of the picnic. This is problematic to publishing, but it is this very problem we would like to place our picnic directly inside of. Still, it is also our distinct wish to collaborate. (We love collaboration!) So, we would like to contribute the invitation for the event to the issue. That invitation will be elaborate–– part invocation, part ilynx-ive reading ritual, part provocation, part score, etc. It is a pact that something will have taken place & is keeping taking place in the processual present. Our work of the past couple weeks (since the Inner Browser Lab) has been in developing & working with what we call a “play mat,” mutable-tactile platform for active conversation. 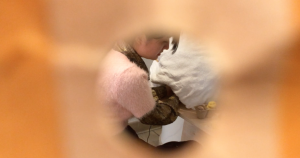 (Some pictures from that here >> https://we.tl/1AEKSn7Pbl) Our plan for the coming days leading up to the symposium is to design a format whereby papers & other assorted notes might be further annotated, interpreted & played [thru/on/with] in real time among & between real bodies. In the meantime–– & any time–– we consider our projects as unruly & porous, predictably (if not impossibly). That is to say: please do adapt any images &/or ideas as/into any apertures that open interestingly to/for you & your projects! Really, we are much more interested in propositional politically than propriety, so permission for us is never an issue. Communication, tho, is especially lovely–– made all the lovelier by the removal of its regulation. A week form today, I’m sure new forms will have emerged from the dust clouds, too. So, we’ll plan to keep revisiting our contributions thusly, to be sure, tho it is hard to tell from the vantage of before-the-symposium just how that might be. 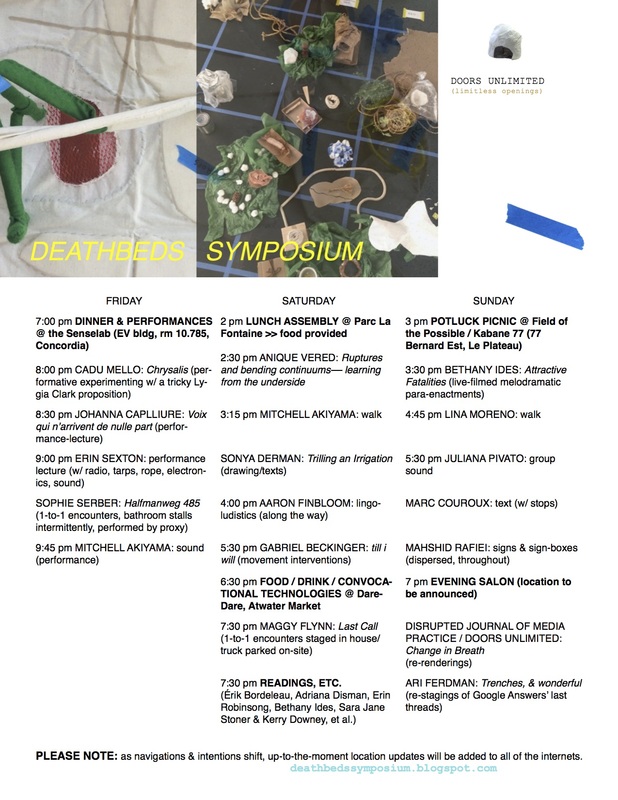 We’ve added a bit more in the way of description to the main Symposium blog, re: our project for dJMP: http://deathbedssymposium.blogspot.ca. Please do feel free to point other contributors toward it &/or put them directly in touch w/ us. It would be wonderful if, for instance, some wanted to send us some of their notes & thoughts on the implications, stipulations & ramifications they see framing their projects &/or thusly, their projects framing. More info will be added to the site in the coming days as well.